A delicious Guide to Hampshire! 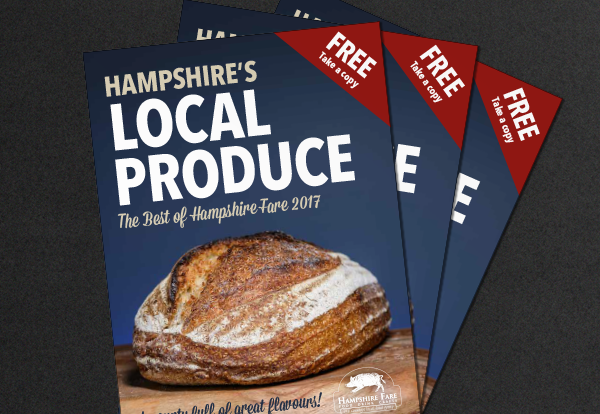 The 2017 Hampshire Fare Produce Guide has landed! This free, bumper 132 page, A5 brochure showcases all that Hampshire has to offer in way of food producers and growers, places to eat and drink and places to stay. As a Corporate Partner to Hampshire Fare we are delighted to see how this guide, and the membership to the organisation, has grown over the years due to the hard work of the dedicated team who are based in the beautiful Rownhams House. In the five years we have been working with them the guide itself has grown from around 40 pages to this years 132 pages. It is great to be associated with like minded people who are as passionate about their various crafts as we are about design!